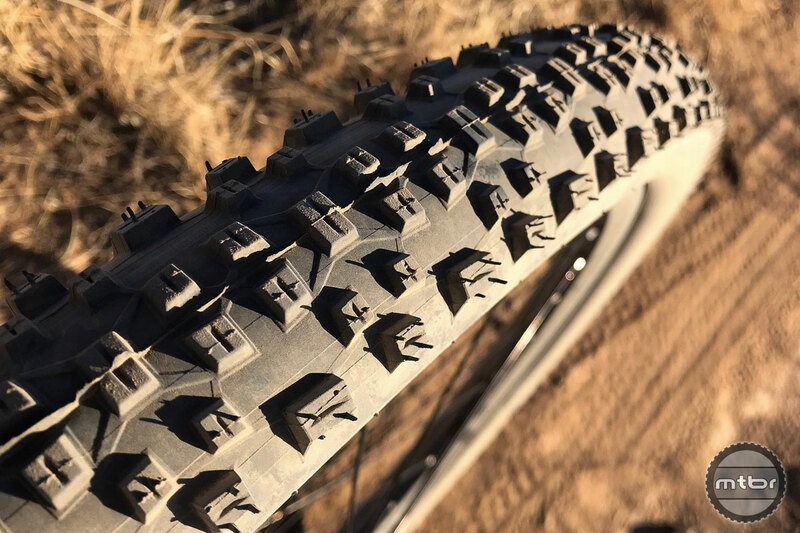 Aside from collecting a little dust, both sidewall and center tread knobs were good as new after our test sessions on the Schwalbe Racing Ralph Addix Speedgrip tires. 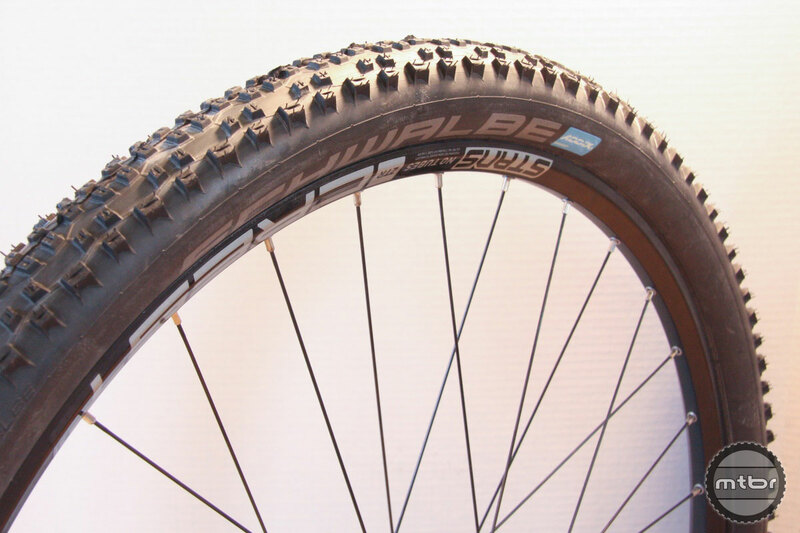 As its name clearly implies, the Schwalbe Racing Ralph Addix Speedgrip is an XC racing tire. The tread pattern is familiar in this class of rubber – more tightly spaced center knobs to increase speed, but taller, more widely spaced side lugs for extra bite when cornering. 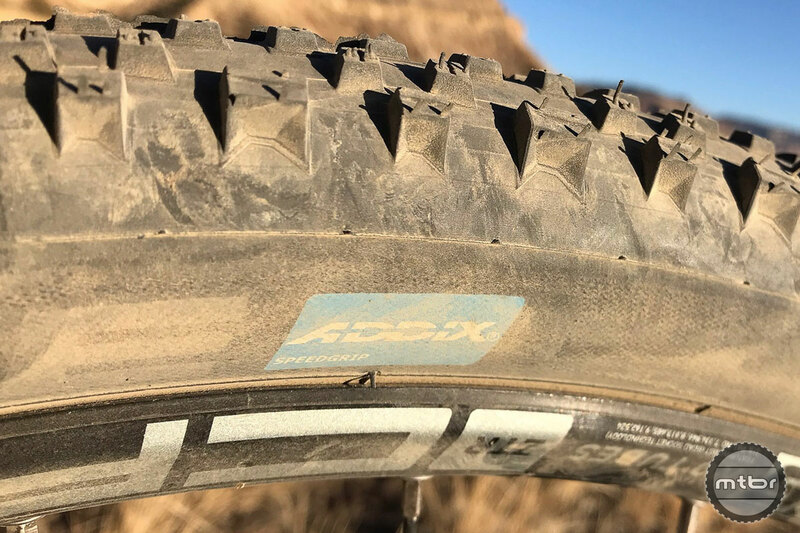 New to this legacy tire is Schwalbe‘s Addix compound, which is actually a series of four compounds specifically developed for various riding disciplines: Speed = XC race; Speedgrip = XC/AM/trail; Soft = enduro/downhill; Ultra Soft = gravity. Of the four, Speed is the only one that’s completely new, while the other three are replacements for existing compounds. Schwalbe expects the Speedgrip to be the most popular, which is in part why we choose it for this test. It’s aimed at general riding in mixed terrain and conditions, and offers similar rolling resistance to its predecessor (PaceStar), but with a claimed 62% increase in durability and 35% bump in grip. To quickly identify the various compounds, Schwalbe is using a colored stripe on the tread, which wears off after a few rides. (Note the blue line on these test tires). The stripe color matches the sidewall markings that denote which compound is used. The EVO designation means this Schwalbe Racing Ralph Addix Speedgrip is a top-of-the-line tire, while TLE Snakeskin implies easy tubeless set-up and enhanced sidewall protection. Read more about Schwalbe’s Addix compound here. 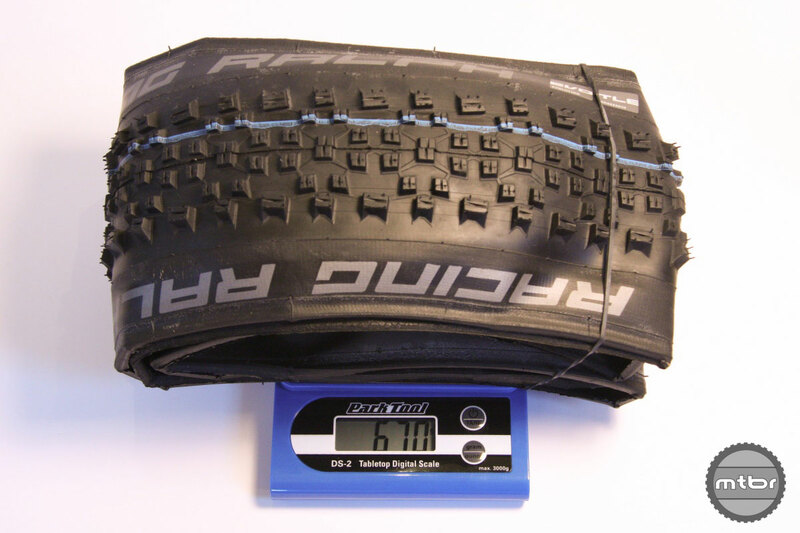 Our test set of 29×2.25 Schwalbe Racing Ralph Addix Speedgrip tires weighed in at a reasonably wispy 670 grams per tire. On the Mtbr Park Tools DS-1 Electronic Scale the Schwalbe Racing Ralph Addix Speedgrip tires weighed 670 grams (40g more than claimed weight). 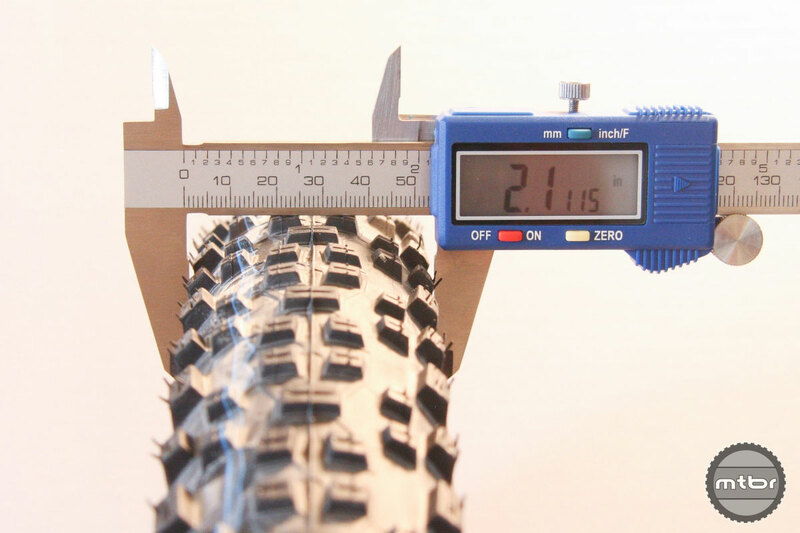 When mounted on a Stan’s ZTR Crest S1 aluminum wheels, which have a 23mm internal rim width, actual tire width measured by the Park Tools DC-1 Digital Caliper was 2.11 (versus the advertised 2.25). Mtbr tested the Schwalbe Racing Ralph Addix Speedgrip on a variety of trail types, including hardpack, loose over hard, and rocky alpine terrain. Keep reading to find out how it performed. Initially it was hard to get past the skinny profile of the Schwalbe Racing Ralph Addix Speedgrip. Though the hot patch on our test tires claimed a width of 2.25, they plumped up to just 2.11 when mounted on a set of Stan’s ZTR Crest S1 aluminum wheels. Within this shootout, only the Hutchinson Toro (labeled 2.35, but actually 2.10) cast a narrower shadow. But over reporting is certainly not unique in this class of tire. 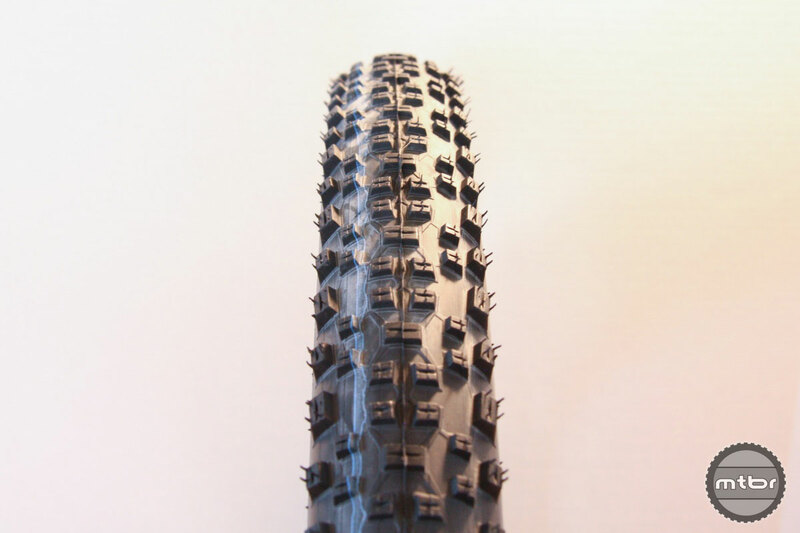 Only two of seven XC tires Mtbr tested for this shootout exceeded manufacturer’s claimed width. TPI count on the Schwalbe Racing Ralph Addix Speedgrip is a middle of the road 67. So while it was hard to overlook, the axiom of size doesn’t matter at least in part applied to this conversation. And really, what matters most isn’t how girthy a tire is, it’s how well it performs. In this case, the answer was quite well. The combination of the new Addix Speedgrip compound and a smart tread layout and design conspired to deliver a tire that was quick off the line, able to maintain speed, and had better than expected grip, especially in terrain where lesser tires start to feel like ice skates. The Schwalbe Racing Ralph Addix Speedgrip was a fast roller that offered better than expected grip even in loose conditions. Like most of the tires in this shootout, the tread layout combines low profile, tightly spaced center knobs with taller more toothy side knobs. In between are staggered transition knobs, with an opening after every second knob allowing the tire to find its edge, but not do it so abruptly as to throw its pilot off line — or off the bike all together. 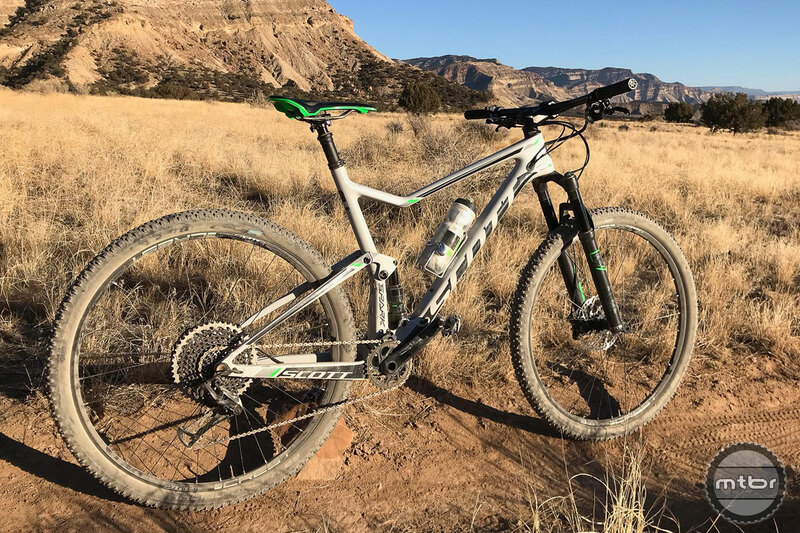 This was especially noticeable during several days of testing in the Fruita, Colorado, riding zone, where the riding surface vacillates between ultra-tacky sandstone and super slippery dust-over-hardpack. The staggered transition tread makes the trip to the cornering tread smooth and predictable. Siping in all the tread knobs enhances overall grip. 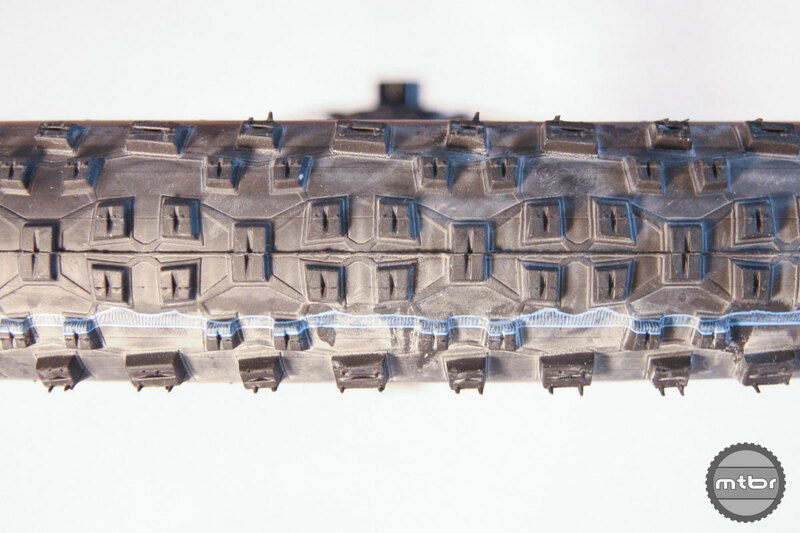 Thanks to some combination of well-conceived tread where every knob is siped for even more grip, and the new compound mixture, we felt reasonably comfortable leaning the Schwalbe Racing Ralph Addix Speedgrip tire over in high speed corners. 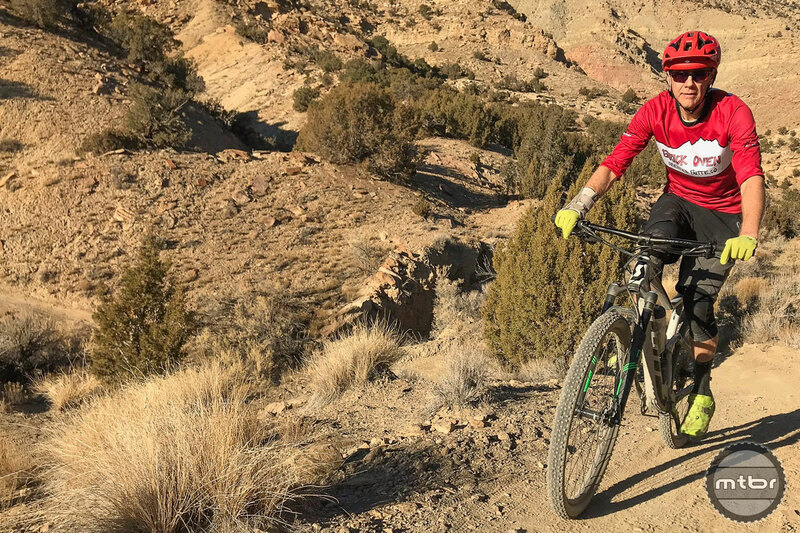 It also did a solid job maintaining bite during hard braking, and only had some trouble on very steep, loose terrain, where maintaining centered body balance over your bike was key to maintaining uphill traction. Perhaps even more impressive was the Schwalbe Racing Ralph Addix Speedgrip tire’s durability. Suffice to say Schwalbes have not always had a reputation for being particularly robust. 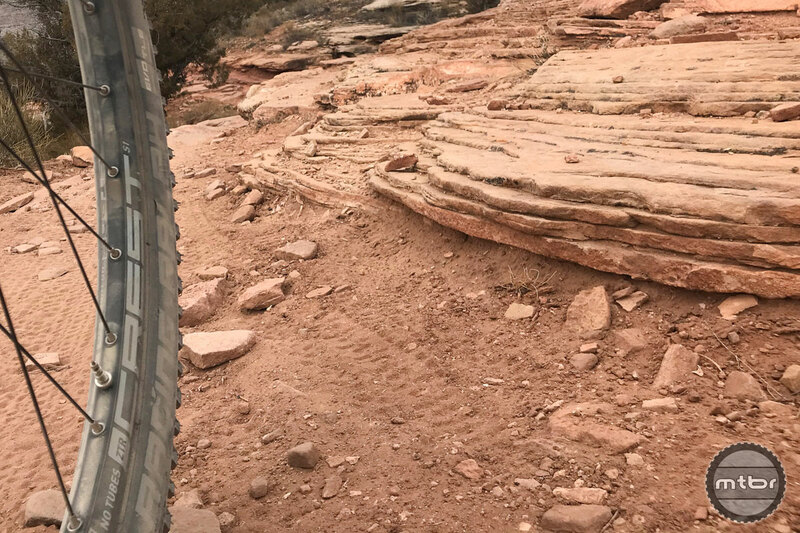 That’s been especially true in places such as Fruita, where sharp sandstone rocks lurk around almost every corner, waiting to slash wimpy sidewalls. But Schwalbe is well aware of its past shortcomings, which is why the top line feature of its new Addix Speedgrip compound is durability. Specifically, the German tire maker claims the new formulation is 62% more durable than its PaceStar predecessor. Addix Speedgrip is one of four new compounds released by Schwalbe in 2017. It’s marketed as having the widest range of use, making it good for everything from XC to enduro. We can’t say the same for these particular tires, which are definitely XC specific. 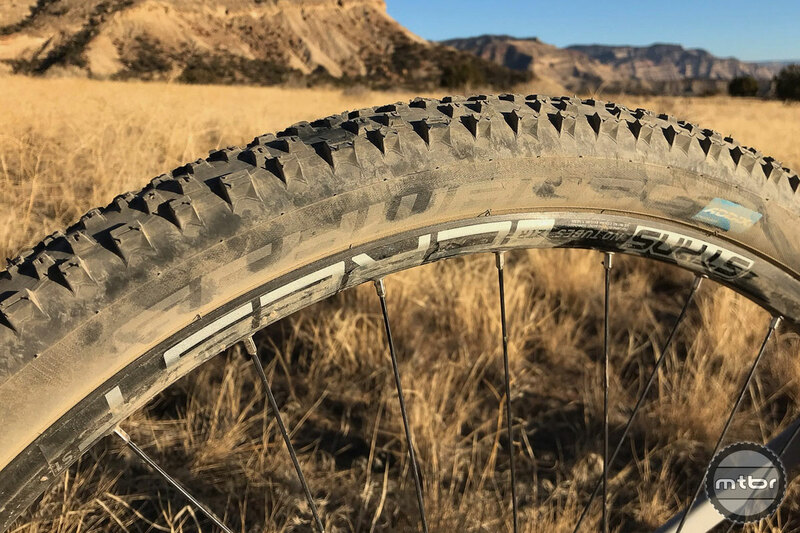 And while metrics such as that are all but impossible to verify, based on our multi-day western Colorado testing session, the Schwalbe Racing Ralph Addix Speedgrip tire has the chops to stand up to the rigors of serious real world riding. We pushed it well passed its XC intentions, but suffered nary a flat or even any discernible wear on the tread or sidewall. And honestly, at $92 a tire, it damn well better be that way. Otherwise why not just buy two sets of a cheaper offering, say the Vee Crown Gems, which sell for nearly $40 less per tire and offer similar performance but less durability. Actual width didn’t exactly measure up to the claimed 2.25 that’s printed on the side of the Schwalbe Racing Ralph Addix Speedgrip tire. Bottom line, while the newest iteration of the Schwalbe Racing Ralph loses points for failing to measure up on width and weight claims, it offers impressive rolling speed, grip, and durability. Just make sure to size up when buying in order to get the actual width you’re after. Aside from collecting a little dust, both sidewall and tread knobs were good as new after our test session. TPI count on these tires is a middle of the road 67. 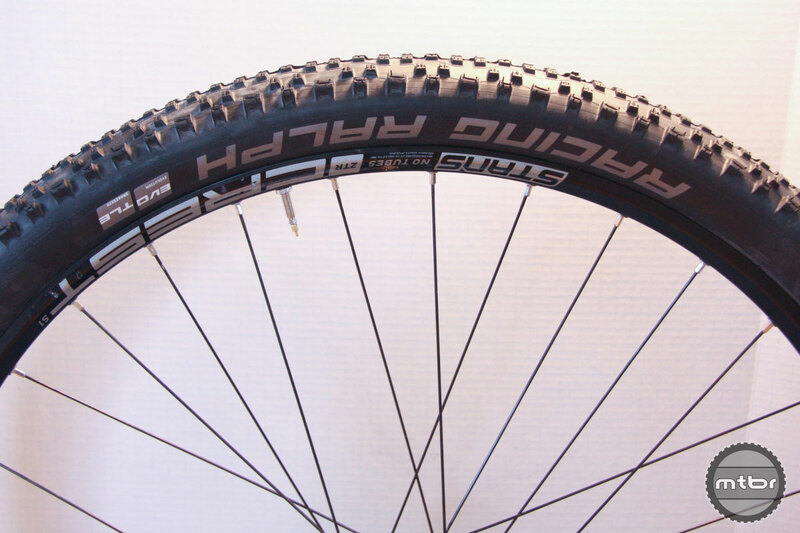 Our test set of 29×2.25 Racing Ralph tires weighed in at a reasonably wispy 670 grams per tire. Actual width didn’t exactly measure up to the claimed 2.25 that’s printed on the side of the tire. The new Schwalbe Racing Ralph Addix Speedgrip sells for a slightly eye-watering $92. The EVO designation means it’s a top-of-the-line tire, while TLE Snakeskin implies easy tubeless set-up and enhanced sidewall protection. That blue line lets you know that this tire is made from the new Addix Speedgrip compound. This angle also provides a good look at the tight spacing (and fast rolling) center tread. The staggered transition tread makes the trip to the cornering tread easy — and predictable. Siping in all the tread knobs enhances overall grip. Trails such as Horsethief Bench near Fruita, Colorado, place uniquely harsh demands on tires. The Racing Ralph was up to the task. As with all the contestants in the Mtbr XC tire shootout, the Racing Ralphs were tested on this high capable Scott Spark. The Racing Ralph was a fast roller that offered better than expected grip even in loose conditions such those pictured. Bear in mind that tyre width is a function of inflation pressure and rim width, neither of which are specified in the article. Also tyres will stretch out as they break in with use so they’re at their narrowest when brand new. I mostly run Conti tyres on my bikes, but last year thought I’d try a Rocket Ron Snakeskin Addix Speed as a front tyre for Winter Bike. Overall I’m very impressed with it, and the Addix compound is a big improvement over the old Pacestar. One thing I did notice though was that the hardest Addix Speed compound is significantly softer (and by extension grippier and less durable) than Conti’s BlackChili compound, which is fine by me as a softer, grippier compound on the front works very well, and if it wears a bit faster then that’s just the price you pay for better grip with any tyre. I bought one of the original Racing Ralphs, many years ago. Back then it had a low profile, rounded tread pattern and rubber so soft I could hear it sucking at the little air pockets when riding over smooth asphalt. It was very fast and insanely grippy, but I tore it to shreds in ten hours of riding. That put me off race-spec Schwalbes until the new Addix compound came along. IMHO they’ve got their compounds just about right now, and it’s nice to have a range of rubber and carcass specs to choose from. If the hardest Speed compound is still relatively soft then I’d love to try out the Ultra Soft compound one day, just for fun. ^ My apologies Jason – I read your article twice looking for a rim width spec and still completely missed it. My bad. I’ll update the graphs with the new measurements at some point – it’ll be interesting to see just how much tyres can flump up once they’ve been broken in. All good — and thanks for the insight.